I see dead people, voting for Maduro like regular people. Ah, if it weren’t for revolutionary slips of the tongue. On the heels of Mario Silva-gate, CNE Board member Socorro Hernández lets us in on a little secret: dead people vote in Venezuela. We know it, the CNE knows it, and now everyone else knows it. The problem with Socorro’s alarming admission is that, up until now, the CNE had sworn the system was bulletproof. If a person can only vote by scanning their fingerprint through a machine, then how exactly is it that dead people vote? Who exactly is voting in the place of dead people? Why isn’t anyone prosecuting these people? When did the CNE find out about this? What are they doing to prevent it from happening? What exactly is the number? How do you know it’s not significant? These are questions that go unanswered. Finally, if the dead vote, then what is preventing people with massive amounts of fake ID cards from voting? Opposition witnesses, that’s who. Which is why the issue of opposition witnesses being forcibly removed from voting centers is crucial to understanding how fraud happened in Venezuela. Socorro Hernández has a history of partisan gaffes. She has admitted to gerrymandering, and she has admitted that chavista figureheads get special treatment. This, however, is the first time in her life that she admits the opposition is right, and that something obscure happened on April 14th. 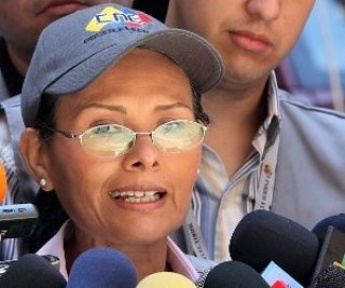 Update: CNE Board member Sandra Oblitas is contradicting Hernández. She says there were no zombie voters. See this post for details.